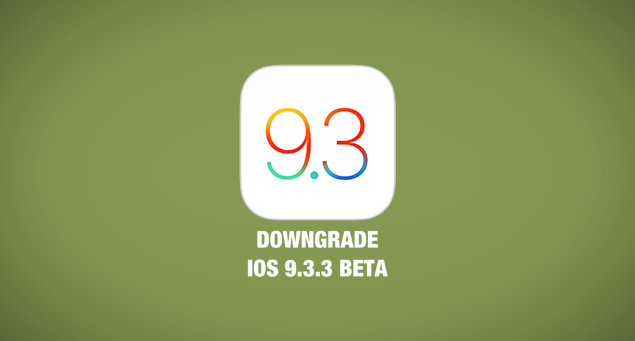 Here’s how to downgrade iOS 9.3.3 beta to iOS 9.3.2 final firmware on iPhone, iPad, iPod touch. Apple released the first ever iOS 9.3.3 beta just yesterday, and from the looks of it, the new piece of software brings with it no more than bug fixes and performance enhancements. But, Apple didn’t patch a major issue with this release – the dreaded Error 56 message plaguing 9.7-inch iPad Pro users. This also means that iOS 9.3.3 beta 1 for 9.7-inch iPad Pro isn’t available for developers either, but our gut feeling suggests that the second beta will see a clear cut fix being released through the developer channel. And speaking of developers, iOS 9.3.3 beta is meant for devs only, for now. This means that iOS 9.3.3 beta is unfinished software, and can run into speed bumps during usage. Therefore, at some point, you might want to downgrade iOS 9.3.3 beta to the current public release of iOS, which is iOS 9.3.2 final. In today’s guide we’ll show you how you can do just that, and all that is required to go through is patience. Nothing more, nothing else. 1. Download iOS 9.3.2 firmware file for your iPhone, iPad, iPod touch. 2. Take a complete backup of your device on either iTunes or iCloud. 3. Connect the device you want to downgrade with your PC or Mac. 4. Make sure you turn off Find My iPhone otherwise the downgrade process won’t go forward. Go to Setting > iCloud > Find my iPhone and move the toggle switch to the OFF position. 5. Launch iTunes on your PC or Mac. 6. Select your device from the top left hand corner of iTunes. 7. Hold down the left Shift key (Windows) or the left Option key (Mac) and then click on the ‘Restore iPhone’ button in iTunes. 8. Select the iOS 9.3.2 firmware file you selected in step 1 and let iTunes do its thing. iTunes will first verify the IPSW file with Apple and then the downgrade process will move forward. It should be kept in mind that during the downgrade process you are requested not to touch your iOS device at all, as you want everything to go as smoothly as possible. Lastly, make sure you have a stable Internet connection at hand otherwise the verification process will keep on failing. Once the downgrade process is complete, your iPhone or iPad will boot straight into the iOS welcome screen, allowing you to set up your device from scratch.